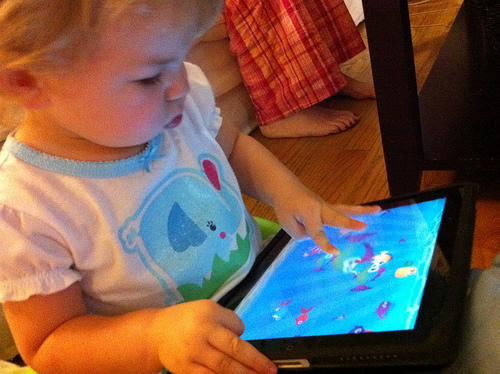 There are an awful lot of tablet books for children out there. You don’t notice at first, with the layout of the App store being what it is, but the more you dig the more you find. And this is early days. Of all the problems that we’ll face in the 21st Century, a shortage of interactive picture book apps is not going to be one. There are tonnes of the buggers. Why is this? Well, picture books are well suited to the woozy and undefined form of tablet books. They are short, for one thing, and have a strong visual element, so on those levels this flood of production makes sense. But there are other reasons why they are so common. There is a common misperception that writing children’s books is easy – or, at the very least, easier than writing a proper adult book with a formidable word count. Traditionally, the job of filtering all the crud has fallen on the shoulders of children’s publishers. This is a highly specialised skill. It takes many years of experience to gain enough insight to understand why one particular story about a lost bear, for example, is qualitatively better than the previous forty stories about lost bears. If you can forgive me generalising for a moment – and gereralising is useful, generally speaking – writers of young children’s books seldom have this strange insight. They often take the view that all the publishers who rejected their creations are damned fools who are throwing away a fortune. Those of a determined frame of mind then experiment with self-publishing or try to sell their ideas to animation companies. As someone at an animation company who reads their letters, I feel I can say with some authority that there is a lot of half-arsed guff around. As a general rule, the worst ideas feature a group of five household objects – buckets, for example, or clothes pegs – that have had faces drawn on them and will somehow get into hilarious adventures. It is also striking how many different people push exactly the same idea. How many people have dreamt up a school for superheroes? It is impossible to count. It is even more, if that is possible, than those who came up with a team of vegetable-based characters who promote healthy eating by battling fatty foods. With tablet book apps though, there are no gatekeepers who will prevent all these picture books from reaching the market. As an economist would put it, the barriers to entry are low, which leads to low profit margins and lower-quality products. There will be a lot of crap out there, in other words, and this will dilute the market and make it harder to sell anything. And the barriers to entry will only get lower, as off-the-peg software emerges to make creating apps get easier. What are the implications of this? Well, it means that tablet books shouldn’t be seen as a brave new frontier, where the old rules don’t apply and the new rules have yet to be written. Tablet books suffer from all the same problems that are terrorising all the existing forms of media. They are competing on a global stage, attempting to attract an audience who are so time-poor and bombarded with choice that they increasingly retreat to the safety of old, established brands and characters. This is not really a context that you can safely ignore, so I’ll be keeping it in mind when I look at a few examples of these picture book apps soon.